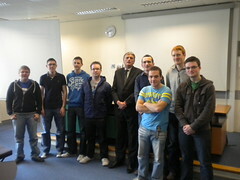 Jim Wells MLA was the Guest Speaker at the March Association Meeting of the DUA which was held on Wednesday 10th March at 1.30pm. 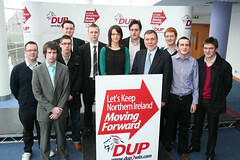 Jim spoke of his time at Queen’s and touched on a number of important issues for the DUP at this time, including the upcoming General Election. A very interesting Question time then followed. Congratulations also go to DUA Member Nathan Anderson, who was successfully elected as the new Vice-President of Education for the new academic term 2010/2011 in the recent Queen’s Student’s Union Executive Sabbatical Elections. This was a fantastic result for Unionism at Queen’s and especially for this Association.